Mobile workers are driving the need to connect — anywhere and anyplace. Soon they’ll do so over high-quality 4K and, shortly following, 8K connections. To support this change in work environments, business audio visual systems are becoming truly unified, connecting PCs, to video conferencing systems and projectors, to employee “bring your own” personal electronics. At the same time new 4K, HDR and 8K video standards bring more challenges as equipment makers need to upgrade systems with those standards to bring their devices to market. 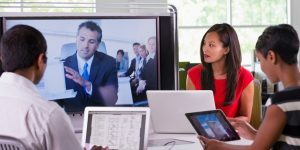 As people move from workplace conference rooms to smaller collaboration spaces to cubicles, they expect fast access to what they need from wherever they are. Crestron today announced that it will use Intel Arria® 10 FPGAs in a new digital media AV distribution system that supports 4K-quality video conferencing and a seamless connection for users, no matter what devices they use. Crestron is demonstrating this new product at Integrated Systems Europe, an event this week in Amsterdam. When programmable, customizable Intel FPGAs are built into these systems, they enable fast time-to-market for devices that support these new connectivity standards and 4K/8K display processing.